← Canberra Conference, 18 October – Join Us! The news today of the passing of Gough Whitlam at the age of 98 sent me scurrying to my archives to look up details of my brief encounter, almost twelve years ago, with one of Australia’s most illustrious Prime Ministers. On 13 December 2002 I was delighted to be invited to attend the AFFORD 50th Anniversary celebrations at the Blacktown Workers Club. For those who may not know, AFFORD (Australian Foundation for Disability) started life as The Poliomyelitis Society in 1952. Once the polio vaccines were introduced, referral of new clients with polio virtually ceased by the mid 1960s and so the organisation diversified its operations to provide services to people with other disabilities, leading along the way to a few name changes – most recently to AFFORD. However, AFFORD strongly acknowledges that their roots lie in providing services to polio survivors and their families. It was a very friendly gathering of about 150 – not all polio survivors, many supporters of the organisation over the years were also there. There was a very detailed photographic spread around the room which graphically illustrated the 50-year history of the organisation. 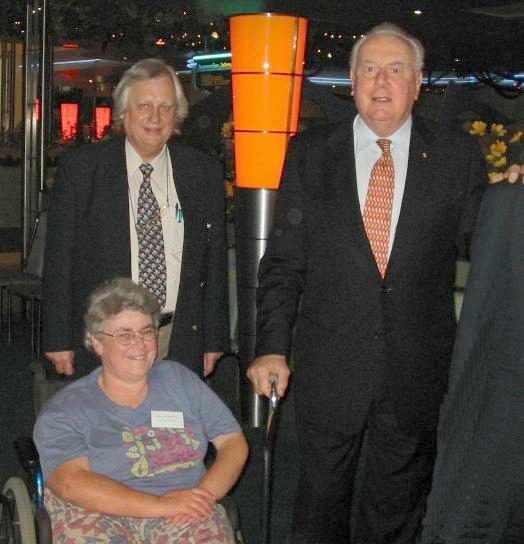 I caught up with some Polio NSW members, including Wendy and Jack Nolan, Margaret Greig and Brian Toby, and saw a number of photographs of them in earlier years. Everyone attending was given a copy of A Concise History which was put together especially for the anniversary. Here we learnt that “The Poliomyelitis Society was established at the height of the most devastating Polio epidemic the State had ever experienced, when over 1,500 cases were recorded and 121 deaths occurred” and that the Society was “dedicated to providing for the after-care of persons suffering from Poliomyelitis and research into the health needs of people with Polio”. As well as giving AFFORD’s history in words and pictures, the 74-page booklet includes a number of stories written by polio survivors (most of whom being Polio NSW members). These stories are fascinating reading and provide an insight into the lives of polio survivors, particularly in the 1950s, 1960s and 1970s. And now to Gough … Gough Whitlam (a patron of AFFORD, appointed in 1966 when he was the Leader of the Opposition) was the special guest at the celebrations and gave a very entertaining talk (in which he praised the work of volunteers many times). After he unveiled a commemorative plaque I chased him around the Blacktown Workers Club so I could introduce myself and the Network – appreciating my persistence, he very graciously stopped for a photo and shook my hand! The man behind me is Dr Malcolm Borland, AFFORD’s President.